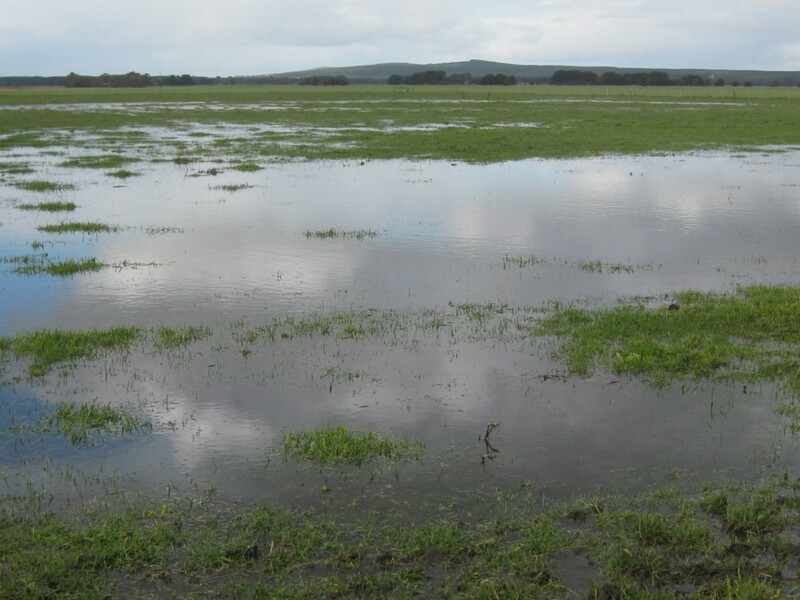 Much of our paddocks are under water, and the drain at one side of our property is on the brink of overflowing – into our farm and our neighbour’s. (Luckily for him, nobody lives on his place.) The big drain at our front farm-gate is growing ominously, aided and abetted by some seepage from our place as well as coming down from the hills some distance away. The major trouble is that all of our wondrous underground water is full to capacity and the land can no longer absorb any more. Kanute has been into town this morning to get some extra fencing materials to put up a temporary electric fence to make a ‘long paddock’ between our front boundary fence and the highway, so our cattle have something to eat. Kanute hasn’t been able to get out to their paddock with the tractor and hay for a couple of days – poor devil had to wheelbarrow a few loads out to them. Not good for the arthritis at all, hence the ‘hasty’ fence. 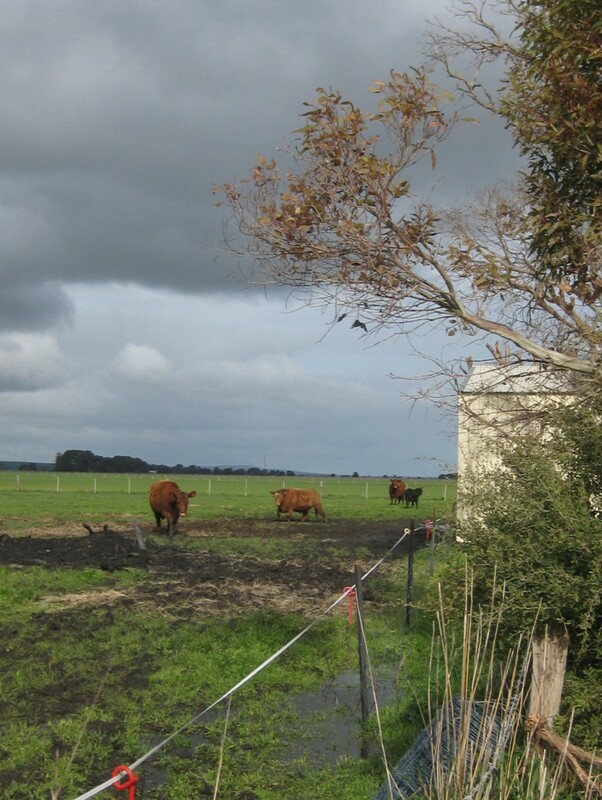 I’ve just finished making three ‘Warning – Electric Fence’ signs to hang on it – a legality so that some poor passerby who may stop to investigate doesn’t get the shock of his life if he touches the wire. I try to ‘sniff’ in sympathy, but it seems to come out in a disgusted fashion for some reason. Of course, we used to have all the electrical ‘stuff’ to make temporary fences wherever we chose, but that of course, was pre-shedfire days. Another of the things we still discover we don’t have anymore – usually on a daily basis. At least the shed is on a higher elevation even than the house, and that’s pretty safe. Still, we are living in hope that we will not have a repeat of the floods of 2000. They happened within 8 months of us moving here, and only weeks after we’d had our beautiful cream carpet installed in 4 rooms of our home. Our local State Emergency Services guys made a chalk mark on the concrete of our verandah surrounding the house, and told us to call them for sand-bagging if it reached that mark. It came close, but never quite up to it. Luckily, there was no actual flow to our flood, it just rose up slowly, insidiously and relentlessly. Just like now. 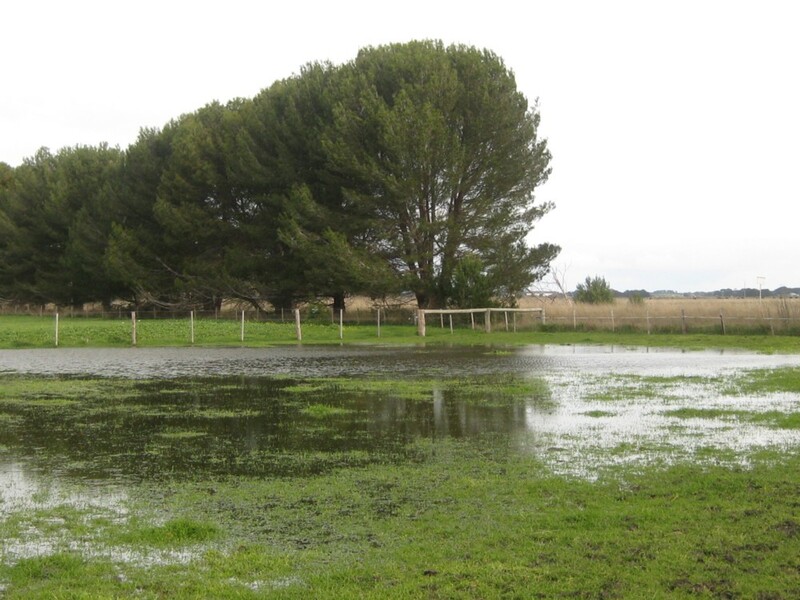 At least our yard only has a few small ponds in it this time… so far. Last time all our trees and bushes stood in the water and seemed unaffected… until the land dried out and tightened and hardened itself around the roots, and finally choked many of them, so that they toppled over months later. That’s painful. 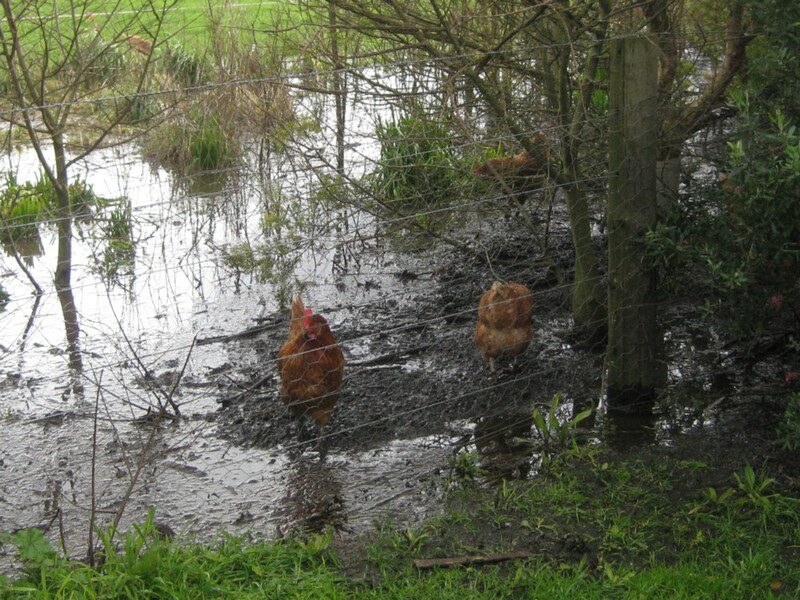 And just after I took this photo, two more waded in to the full depth of their stick legs and proceeded to scratch vigorously in whatever lurks beneath. Luckily, they all still choose to lay their eggs in the chook house (that’s the place they call Home) – but you should see the colour they wear at a time like this. Can’t tell you how happy I am that Kanute took over this job from me years ago! These days I’ll happily see to the cooking and keeping the home fires burning… in between great bouts of time spent at my computer! I’ll keep you posted if we should need waterwings and flippers, or pontoons… or an Ark?